At the heart of a cross arts project is the skill of direct observation and the development of this runs through all the activities. This mapping exercise is a way of encouraging children and adults to look closely at their immediate surroundings and particularly to notice how these change with the seasons. It was planned as a continual seasonal activity throughout the workshop programme and could result in presentation or exhibition of the maps. In this project these maps were developed by the adult groups into large batiked panels of silk which recorded the seasonal changes of the estuary. Each group was given a piece of card and a different short route to map. They returned to the same route each season. The routes included three stopping places to be chosen by the group. Before leaving they read an observation poem. Choose one person to map and record each of the three sections of the route. Choose three stopping places and give each one a name. At each stopping place, record what you observe, hear, touch, smell, using your observation sheet to help you. Notice the changes in the landscape since your last visit, paying special attention to the colours. Collect any material to illustrate your map. On return to base, transfer chosen details from observation sheets to maps. 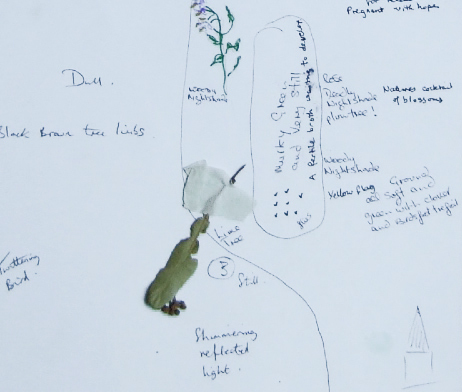 Drawings and gathered materials can be collaged or stuck to the map. 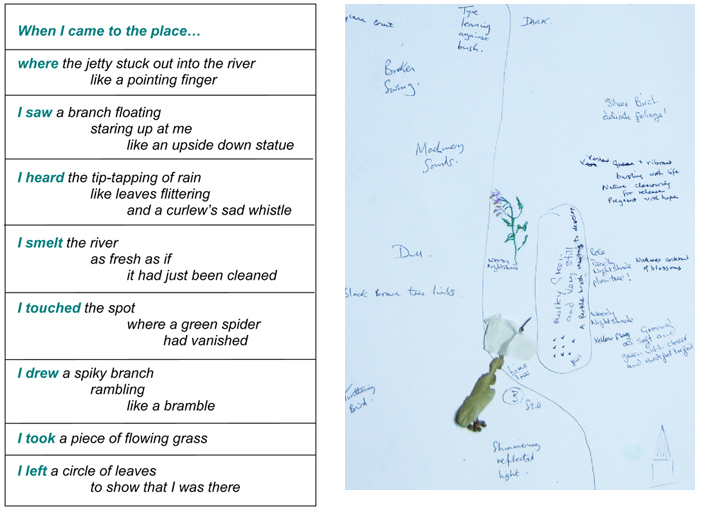 This mapping activity was first developed during the cross arts weekends held at Northcourt Manor, and devised by writer Philip Gross and artist Zelie Gross. On that occasion, we spent most of the weekend engaged in mapping. In a final session, each group presented the others with their map and read individual and collaborative poems based on their journeys. Take a new map with the route lines already drawn as a reminder. Make at least one written note and one sketch at each stopping place, based on observations made with any of your senses.